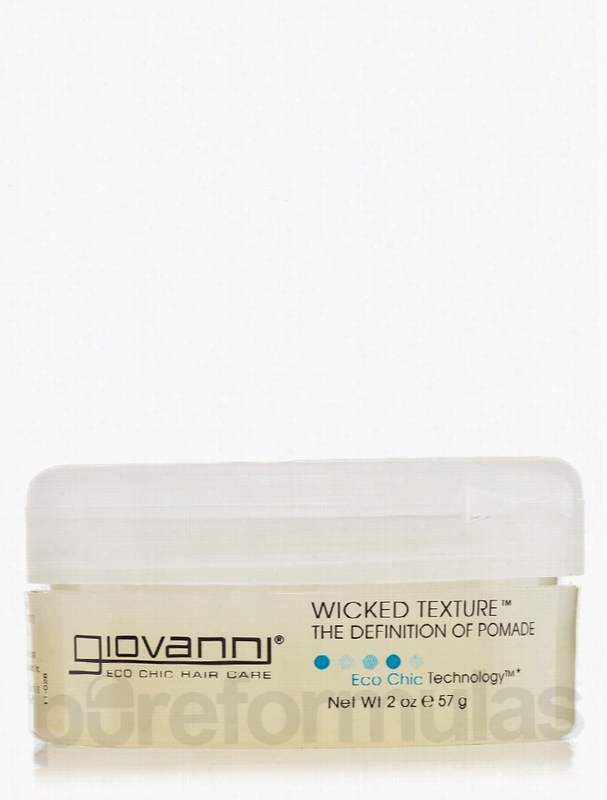 Giovanni Cosmetics Hair - Wicked Texture The Definition of Pomade. You may attain a stylish look by waxing your hair with Wicked Texture&trade; The Definition of Pomade Styling Wax 2 oz from Giovanni&reg; Cosmetics. If you want to define your hair and style it simultaneously&sbquo; soybean extracts in the styling wax may prove beneficial. Soybean may not only help enhance the protein content in your hair strands&sbquo; but also make your hair appear shiny and healthy. Research suggests that Achillea Millefolium Extract&sbquo; also known as yarrow Oil&sbquo; helps promote hair growth. Althaea Officinalis Root and marshmallow extracts may help condition your tresses for that defined look. Horsetail and chamomile flower extract in this styling product from Giovanni&reg; Cosmetics may nourish hair&sbquo; provide sheen and add renewed vigor to it. . Other essential oil blends like lavender and peppermint may help soothe the scalp and keep away scalp infections. These oils may ensure that there is no product build up left in the hair. Sage and thyme extracts in the styling wax may help you style your hair by adding more elasticity to your tresses. In addition&sbquo; coltsfoot and nettle extracts in Wicked Texture&trade; The Definition of Pomade Styling Wax 2 oz from Giovanni&reg; Cosmetics may enrich and nourish your hair. These statements have not been evaluated by the Food and Drug Administration (FDA). These products are not meant to diagnoseÃ¢ÂÂ treat or cure any disease or medical condition. Please consult your doctor before starting any exercise or nutritional supplement program or before using these or any product during pregnancy or if you have a serious medical condition. Giovanni Cosmetics Hair - Magnetic Energizing Shampoo - 8.5 fl. oz. If you are looking for a shampoo to strengthen&sbquo; soften&sbquo; cleanse and repair your hair&sbquo; you may discover these results in Magnetic Energizing Shampoo from Giovanni&reg; Cosmetics. This unique organic formula&sbquo; apart from cleansing and conditioning your scalp may also give your hair a glossy look. Magnets have been used over the years to encourage overall health and physical well-being. As hair grows it becomes more negatively charged. This supplement from Giovanni&reg; Cosmetics contains particles of magnetite&sbquo; a mineral that has a magnetic charge. Magnetite could repel the negative charge present in your hair. Lactoferrin present in this supplement from Giovanni&reg; Cosmetics is a metalloprotein that also has magnetic properties. A micromagnetic base present in this product could cleanse the scalp of oils and residue&sbquo; thereby giving hair a glossy look. In addition&sbquo; sunflower seed oil contains omega-6 fatty acids that could moisturize the scalp and add volume to hair. Rosemary leaf extracts could balance the oil production in your scalp. Rosemary extracts and essential oils give your hair a lovely fragrance. 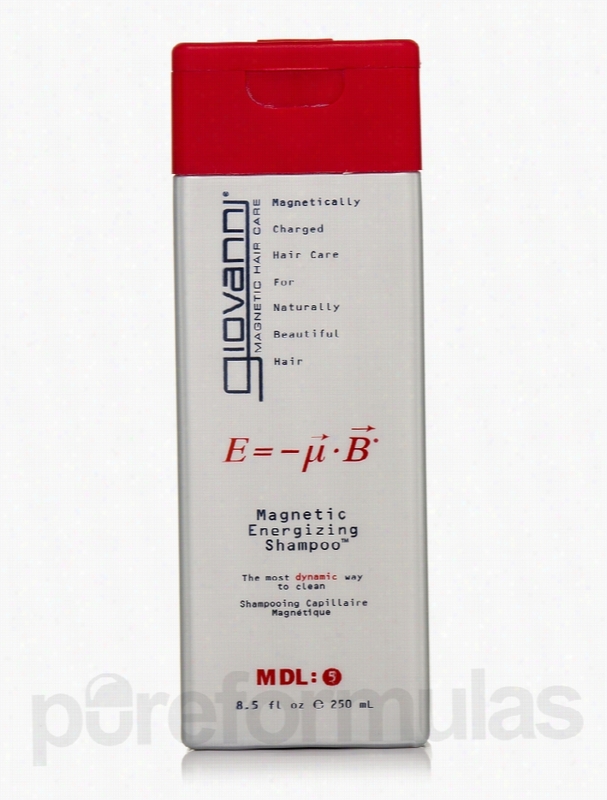 Switch to Magnetic Energizing Shampoo from Giovanni&reg; Cosmetics to fortify your hair. These statements have not been evaluated by the Food and Drug Administration (FDA). These Products are not meant to diagnoseÃ¢ÂÂ treat or cure any disease or medical condition. Please consult your doctor before starting any exercise or nutritional supplement program or before using these or any product during pregnancy or if you have a serious medical condition. Giovanni Cosmetics Hair - Flat Iron Styling Mist - 4 fl. oz (118 ml). 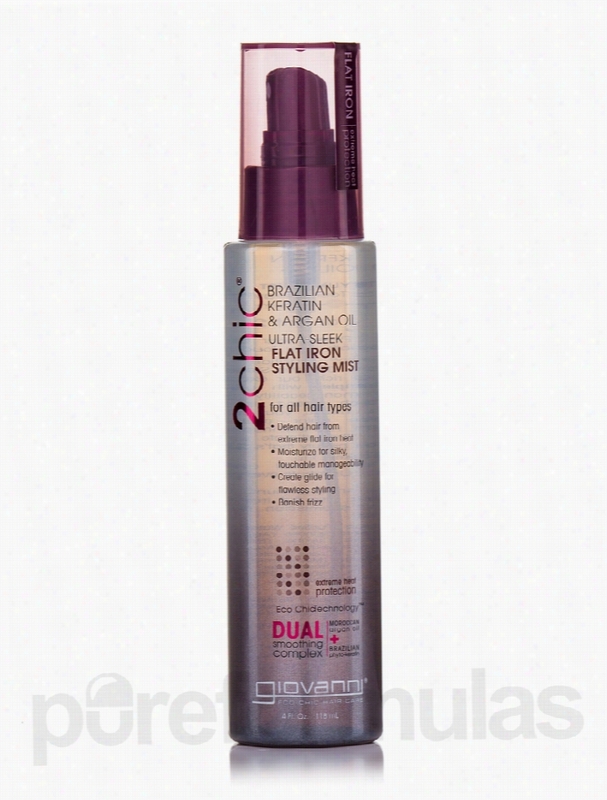 2chic&trade; Flat Iron Styling Mist for all hair types 4 fl. oz (118 ml) from Giovanni&reg; Cosmetics may help style your hair to perfection while you are ironing it straight. You can attain those smooth&sbquo; silky and adorable tresses by using the styling mist. Formulated with Brazilian Keratin &amp; Moroccan Argan oil&sbquo; the styling mist may contain enriching proteins imparted by these ingredients. They may also help achieve smoothness and silkiness in your hair strands. Argan oil may help tame those fly-aways and frizzy hair with its enriching protein formula. You may choose to spray this styling mist from Giovanni&reg; Cosmetics as often as you want&sbquo; while you are ironing your hair. Coconut oil and shea butter extract are well-known for their nourishing and moisturizing properties and may thus impart hydration and moisture to your hair locks. Choose 2chic&trade; Flat Iron Styling Mist for all hair types 4 fl. oz (118 ml) from Giovanni&reg; Cosmetics for keeping hair safe and protected from the harsh effects of heat and styling. These statements have not been evaluated by the Food and Drug Administration (FDA). These products are not meant to diagnoseÃ¢ÂÂ treat or cure any disease or medical condition. Please consult your doctor before starting any exercise or nutritional supplement program or before using these or any product during pregnancy or if you have a serious medical condition. Giovanni Cosmetics Hair - Shine of the Times High Gloss Finishing Hair. Shine of the Times&trade; High Gloss Finishing Hair Mist from Giovanni&reg; Cosmetics may finish your hairdo for a smooth and shiny look. Silicone&sbquo; the main ingredient of this hair mist&sbquo; may smooth hair and give it a glossy look. Silicone is also usually an ingredient in shampoos&sbquo; hair conditioners and hair serums and may help you achieve a sleek and polished look. Botanicals like California poppy and Rose Hips fruit extract may nourish the hair and may come in handy for achieving a cosmetic and professional look. Essential oils like Rosemary and Wild Bergamot in the hair mist from Giovanni&reg; Cosmetics may add moisture to the strands to make them more manageable. It may make just-done hair appear tamed and smooth. Timeless secrets of dimethicone oils may give a slippery look to the hair and make it appear moisturized naturally. 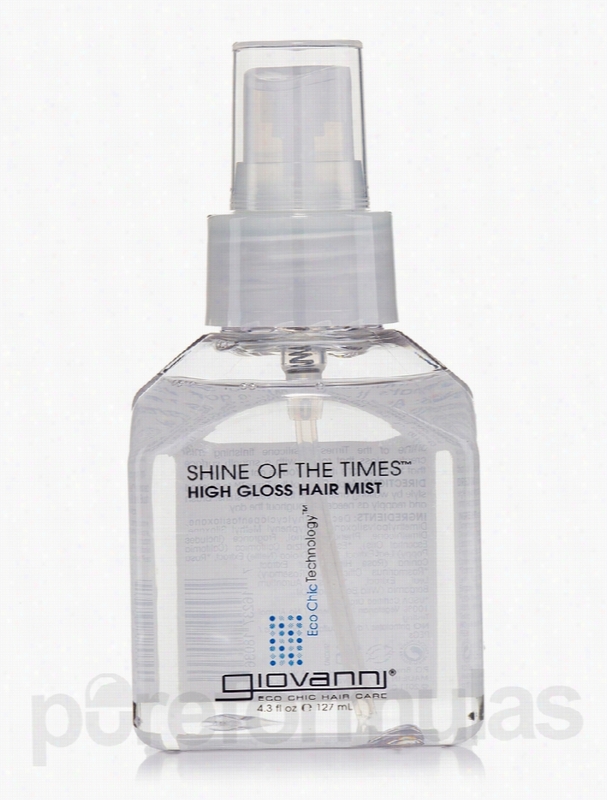 Shine of the Times&trade; High Gloss Finishing Hair Mist from Giovanni&reg; Cosmetics may help your hair look shiny all day long. These statements have not been evaluated by the Food and Drug Administration (FDA). These products are not meant to diagnoseÃ¢ÂÂ treat or cure any disease or medical condition. Please consult your doctor before starting any exercise or nutritional supplement program or before using these or any product during pregnancy or if you have a serious medical condition. Giovanni Cosmetics Hair - Magnetic Attraction Styling Gel - 6.8 fl. oz. Magnetic Attraction Styling Gel&trade; from Giovanni&reg; Cosmetics may help you style your hair effectively. The styling product does not appear to build up in the hair&sbquo; leaving the hair styled stunningly. This styling gel from Giovanni&reg; Cosmetics contains flower and leaf blends. Grapefruit and sunflower seed extracts may work on your hair strands to leave a moisturizing effect. They may make hair appear stylish and settled. Rosemary leaves and clary extracts may revive hair health and provide a boosting effect. Coltsfoot flowers and sage leaves are known for keeping the hair clean&sbquo; and may ensure that there is no build-up of product in your hair. These extracts may also ensure less hair loss. Soybean and thyme extracts in the styling gel may nourish your hair. When there are adequate amounts of protein in the hair&sbquo; it may result in a natural and shiny look. 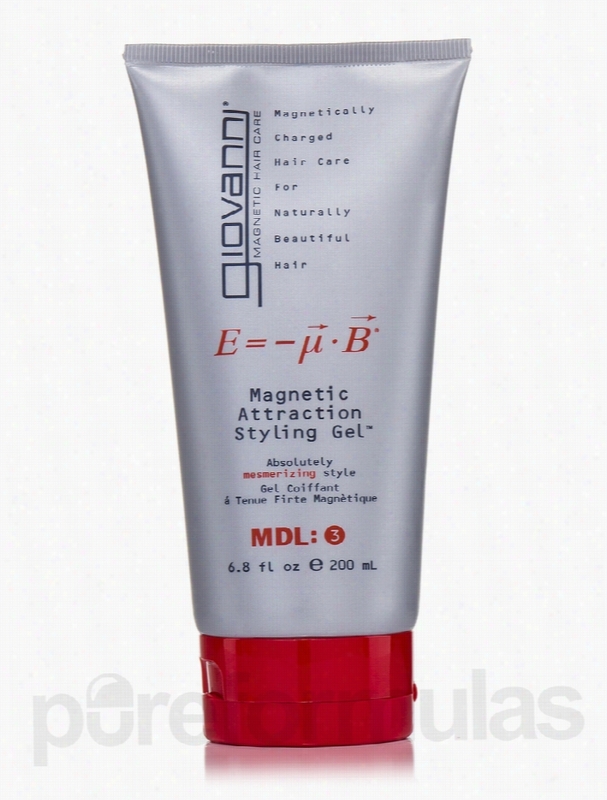 Magnetic Attraction Styling Gel&trade; from Giovanni&reg; Cosmetics may build body and shape for an attractive and energized look. These statements have not been evaluated by the Food and Drug Administration (FDA). These products are not meant to diagnoseÃ¢ÂÂ treat or cure any disease or medical condition. Please consult your doctor before starting any exercise or nutritional supplement program or before using these or any product during pregnancy or if you have a serious medical condition. 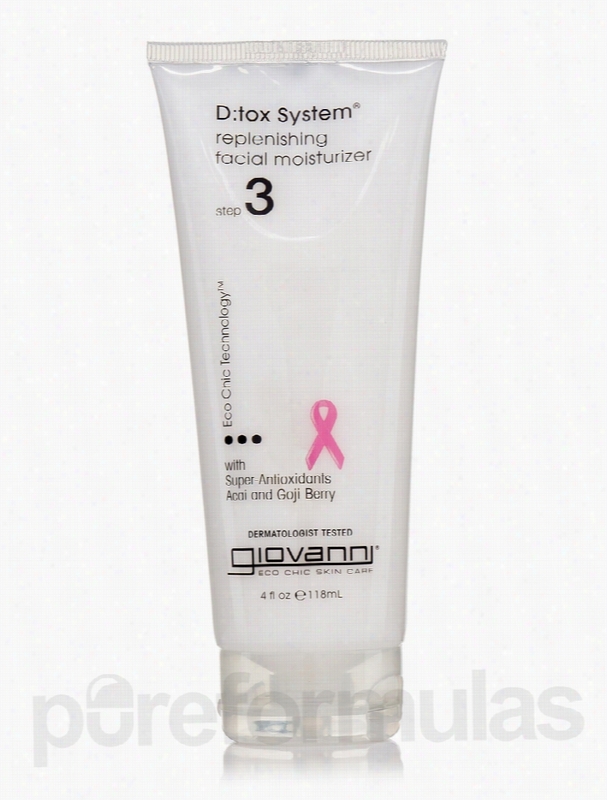 Giovanni Cosmetics Skin Care - D:tox System Replenishing Facial. D:tox System&reg; Replenishing Facial Moisturizer (Step 3) 4 fl. oz (118 ml) from Giovanni&reg; Cosmetics may help revive&sbquo; rejuvenate and moisturize your facial skin. Green tea and fig fruit extracts in the facial moisturizer from Giovanni&reg; Cosmetics contain loads of antioxidants which may help your skin fight free radicals. When your facial skin is healthy&sbquo; it helps you look more youthful. Acai or goji berry extracts in the moisturizer from Giovanni&reg; Cosmetics may help add adequate levels of moisturizing properties to your facial skin. It may help in keeping away dryness and irritation in the skin. Your skin may feel more recharged than ever. Soybean&sbquo; shea butter&sbquo; Vitamin E and jojoba oil are blended together in the moisturizer which may help enhance hydration in your skin. Your skin may become supple and smooth&sbquo; naturally. Sugar maple&sbquo; lemon fruit and Valencia orange extracts in D:tox System&reg; Replenishing Facial Moisturizer (Step 3) 4 fl. oz (118 ml) from Giovanni&reg; Cosmetics may help renew dead cells in the skin to help it appear livelier. These statements have not been evaluated by the Food and Drug Administration (FDA). These products are not meant to diagnoseÃ¢ÂÂ treat or cure any disease or medical condition. Please consult your doctor before starting any exercise or nutritional supplement program or before using these or any product during pregnancy or if you have a serious medical condition. 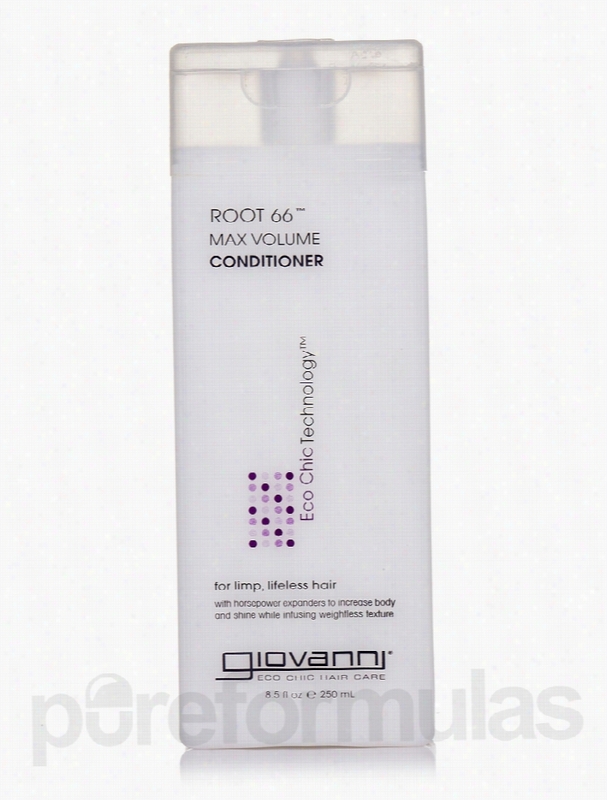 Giovanni Cosmetics Hair - Root 66 Max Volume Conditioner - 8.5 fl. oz. Root 66&trade; Max Volume Conditioner for limp&sbquo; lifeless hair 8.5 fl. oz from Giovanni&reg; Cosmetics may transform lifeless and dull hair to bouncy and shiny. It may add to your hair&rsquo;s volume and protect it from further damage. Horsetail extracts in the max volume conditioner from Giovanni&reg; Cosmetics may act very effectively. Rich in nutrients&sbquo; horsetail extracts may heal damaged hair. With high silica content&sbquo; horsetail helps maintain the shaft strong. Silicone may help impart sparkle and gleam to your tresses. Silicone appears to detangle your hair and make it simple for you to brush through them. Cetearyl Alcohol&sbquo; Stearyl Alcohol&sbquo; and Cetyl Alcohol are known for their protein imparting properties and may strengthen the already existing hair proteins. Your hair may also attain inner shine and a healthy look. Aloe vera leaf extracts in the conditioner may make your hair appear moisturized and hydrated. Kiwi and papaya extracts might add up to your hair&rsquo;s suppleness and strengthen your hair locks. Mango fruit extracts may enrich your hair proteins&sbquo; while calendula flowers in Root 66&trade; Max Volume Conditioner for limp&sbquo; lifeless hair 8.5 fl. oz from Giovanni&reg; Cosmetics may fortify the strands. These statements have not been evaluated by the Food and Drug Administration (FDA). These products are not meant to diagnoseÃ¢ÂÂ treat or cure any disease or medical condition. Please consult your doctor before starting any exercise or nutritional supplement program or before using these or any product during pregnancy or if you have a serious medical condition. 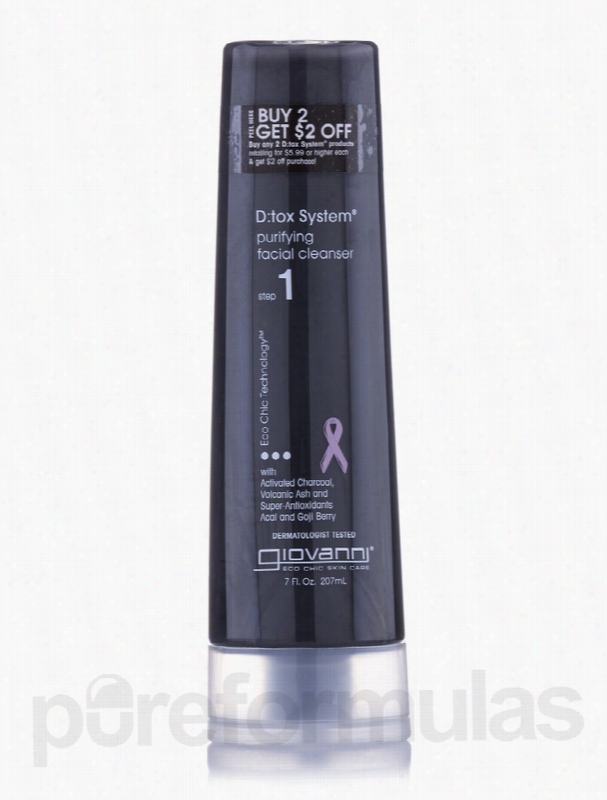 Giovanni Cosmetics Skin Care - D:tox System Purifying Facial. D:tox Purifying Facial Cleanser (Step1) 7 fl. oz from Giovanni&reg; Cosmetics may help cleanse and detoxify your facial skin. You may use this cleanser to remove all traces of eye and face Makeup and to keep your skin clear of impurities. Your skin is exposed to many pollutants and impurities on a daily basis&sbquo; which may get lodged and block the pores&sbquo; leaving behind acne. Volcanic ash in this facial cleanser from Giovanni&reg; Cosmetics may help absorb such impurities from the internal layers of your skin and push them out to the skin&rsquo;s surface. To cleanse away the dirt deposited on the skin&rsquo;s surface&sbquo; the activated charcoal particles in this face cleanser may be versatile. Acai berry extracts contain antioxidant properties which may refresh your face and leave it bright. Vitamin E and Vaccinium Myrtillus fruit extracts may leave your skin nourished and rejuvenated. Green tea&sbquo; blended into the cleanser&sbquo; may act like an astringent on your skin. It appears to keep skin maintained&sbquo; clean and clear. To remove makeup efficiently and to get rid of environmental impurities deposited on your skin&sbquo; you may use D:tox Purifying Facial Cleanser (Step1) 7 fl. oz from Giovanni&reg; Cosmetics. These statements have not been evaluated by the Food and Drug Administration (FDA). These products are not meant to diagnoseÃ¢ÂÂ treat or cure any disease or medical condition. Please consult your doctor before starting any exercise or nutritional supplement program or before using these or any product during pregnancy or if you have a serious medical condition. Giovanni Cosmetics Hair - Ultra-Sleek Shampoo - 8.5 fl. oz (250 ml). Ultra-Sleek Shampoo from Giovanni&reg; Cosmetics is an organic supplement for all types of hair that helps infuse life into your hair and make it more manageable. This unique vegetarian formula also aids dull hair and gives it a healthy shine. This shampoo provides the dual goodness of Brazilian keratin and Moroccan Argan oil. Keratin is a protein present in hair&sbquo; skin and nails and appears to have moisturizing properties. Brazilian phyto-keratin extract present in this organic supplement from Giovanni&reg; Cosmetics is rich in antioxidants that could repair damaged hair and control frizzy ends. Moroccan Argan oil helps tame frizzy ends&sbquo; moisturizes hair and gives it a shiny look. This rare oil is rich in fatty acids and vitamin E that help gives your hair a healthy boost. Jojoba seed oil could unclog hair follicles and reduce hair loss. It helps maintain healthy and beautiful hair by penetrating the hair shaft to reduce sebum build up and aids dull hair. Panthenol&sbquo; a pro-vitamin B5&sbquo; imparts gloss and shine to hair and may detangle and moisturize it. 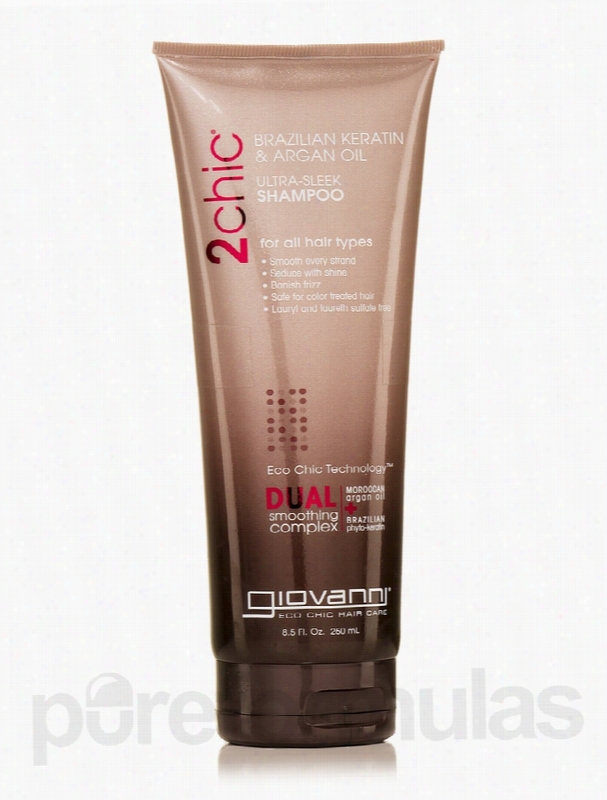 Switch to Ultra-Sleek Shampoo from Giovanni&reg; Cosmetics today and enhance your hair health. These statements have not been evaluated by the Food and Drug Administration (FDA). These products are not meant to diagnoseÃ¢ÂÂ treat or cure any disease or medical condition. Please consult your doctor before starting any exercise or nutritional supplement program or before using these or any product during pregnancy or if you have a serious medical condition. 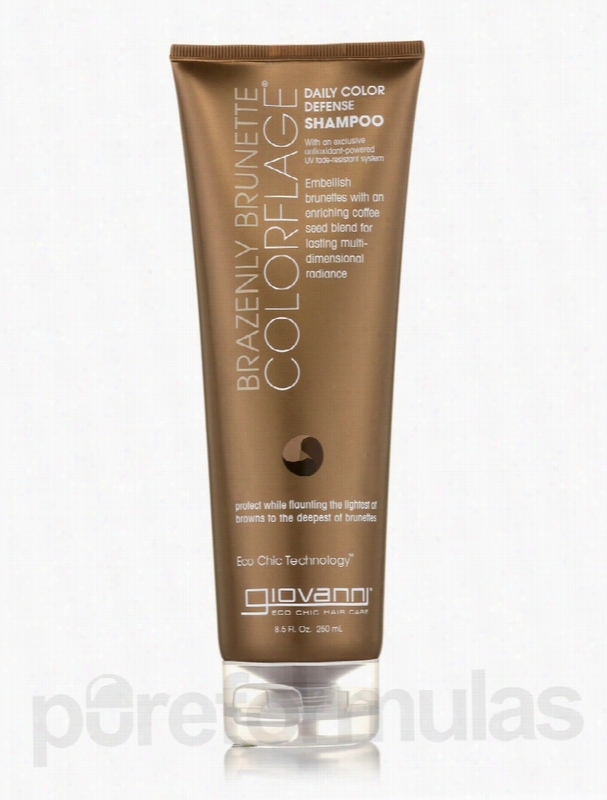 Giovanni Cosmetics Hair - ColorFlage Brazenly Brunette Shampoo - 8.5. ColorFlage&reg; Brazenly Brunette Daily Color Defense Shampoo 8.5 fl. oz from Giovanni&reg; Cosmetics may help lock-in the pigmentation of your beautifully colored hair. It may also add onto the shine and gloss of your hair strands. Mainly made from a blend of goji berries and coffee seeds&sbquo; the shampoo from Giovanni&reg; Cosmetics may help upkeep the color in your hair. Goji berries&sbquo; in particular&sbquo; may prevent hair fall that may occur when your strands are subjected to coloring too often. Your recently done highlights might glow and appear glossy with the help of caramel and cinnamidopropyltrimonium chloride. Herbal extracts like turmeric root may help promote hair growth and treat scalp conditions as well. Crocus sativus flowers may help maintain the tint in your shaft and impart fade resistance. Horsetail extracts in the shampoo have antioxidant and anti-inflammatory properties and so&sbquo; may help keep scalp infections at bay. These extracts may also help thicken and maintain your hair volume. To enrich your recently done coloring and highlights&sbquo; you may buy ColorFlage&reg; Brazenly Brunette Daily Color Defense Shampoo 8.5 fl. oz from Giovanni&reg; Cosmetics. These statements have not been evaluated by the Food and Drug Administration (FDA). These products are not meant to diagnoseÃ¢ÂÂ treat or cure any disease or medical condition. Please consult your doctor before starting any exercise or nutritional supplement program or before using these or any product during pregnancy or if you have a serious medical condition.